Marshall Islands is composed of 29 atolls. It attained its independence from the US in 1986 under a Compact Free Association. 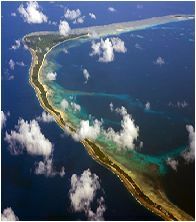 Under the compact, the US pays an annual rent to use the Kwajalein atoll as a base and missile test range. Marshall Islands is also at risk to rising sea levels. Although there are no disclosed restrictions to foreign investment, and foreigners can in fact lease land for up to 50 years, land tenure poses as a problem for development in the country. Land ownership is based on ancestry therefore foreign investors who wish to lease land must negotiate directly to the customarily owners of the land.